Soufflé is a baked delicacy of French origin. Although it can be both savoury and sweet, the latter is more famous. You must try the lip-smacking wonders in this category, like the well-known Strawberry Souffle and the Thandai Souffle , a desi variant we came up with. A creamy, lemony, wobbly soufflé, served with stewed peaches and a unique chocolate boondi, this dessert is so awesome that your guests will be talking about it for days to come. Actually, it is the chocolate boondi that makes it so special, because it is so innovative. Another recipe of this eggless Mango Soufflé combines the divine flavour of mangoes with the ethereal texture of soufflés to give your palate a treat that is par comparison. Traditional thandai is used to flavour this souffle making it a very unusual combination. Discover how delicious strawberries taste this way. A cool delicious dessert item,orange souffle is a souffle recipe prepared from eggs, fresh prange juice, orange rind, sugar and cream.A classic dessert item which is best enjoyed on a hot summer afternoon. Browse through our recipe collection of lemon souffle recipes and souffle recipes, including our eggless lemon souffle recipe. A lovely eggless lemon souffle recipe with a soft texture and awesome lemony taste in a creamy souffle. Any other plain chocolate can be used. Browse through our recipe collection of pineapple souffle recipes and souffle recipes, including our egoless souffle recipe. A lovely egoless pineapple souffle recipe with a soft texture and awesome fruity taste in a creamy souffle. A cool delicious dessert item, Pineapple walnut souffle is a souffle recipe prepared from eggs, pineapples, sugar and chopped walnuts. A classic dessert item which is best enjoyed on a hot summer afternoon. A luscious, creamy and delectable souffle recipe, Choco soufflé is enriched with a rich chocolate flavour and creamy texture. A cool delicious fruit and nut based souffle item, chocolate souffle is a souffle recipe prepared from eggs, cocoa powder, sugar and fresh cream. A classic dessert item, chocolate souffle is best enjoyed on a hot summer afternoon. A creamy and lip smacking souffle recipe, Banana soufflé has sliced bananas blended with cream and egg whites. Decorate the banana soufflé with grated chocolate and banana slices. 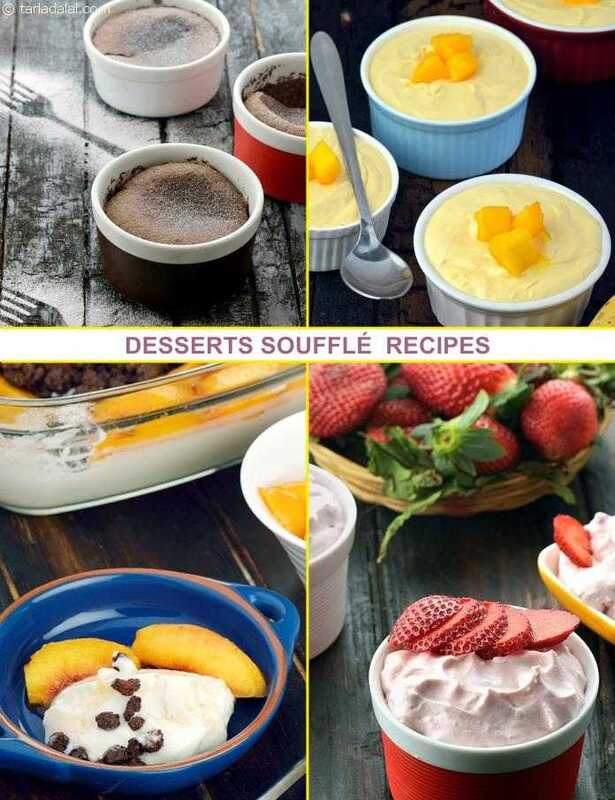 A cool delicious souffle recipe, fruit souffle is a fruit flavoured dessert recipe prepared from eggs, mixed fruits, sugar and chopped nuts. A tempting a nd mouthwatering dessert item, chilled fruit souffle is best enjoyed on a hot summer afternoon. Caramel souffle is a fluffy and soft baked cake with caramel. To get a thick cream beat it over ice cubes for 5 mnts.